Naji is 60 years old, he originates from Anbar. In 2014 ISIS took over his town and he was forced to live under ISIS regime for 8 months. When ISIS started recruiting young males, Naji and his 24 years old son escaped to Kurdistan. 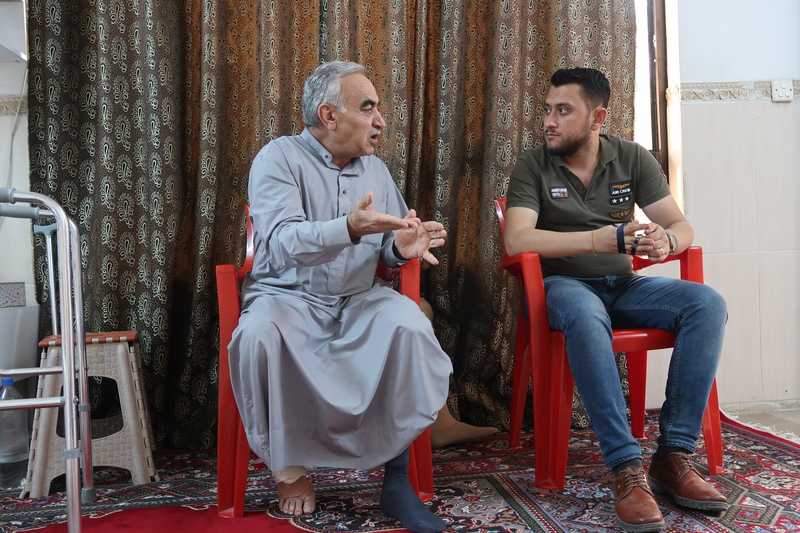 Now Naji lives with his son and his wife in a small flat in Erbil. His three other daughters are married and have already left home. Two of them are now back in Anbar. Naji would also like to go back to his hometown, but safety is still not guaranteed in those regions. 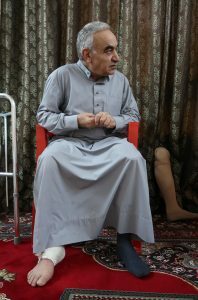 Naji fought the Iraq-Iran war and lost his leg in an explosion. Because of this disability, the years of displacement have been particularly hard for Naji. Indeed, the lack of adequate equipment and the prolonged poor living conditions worsened his conditions increasing his back pain and preventing him from walking at all. Because of his disability, Naji has also not been able to work which made it impossible to afford the health services he needed. Thanks to the French Association for the Aid of Youths with Disabilities and People with Handicaps (Association pour l’Aide aux Jeunes Infirmes et aux Personnes handicapées), Naji was able to receive a proper new leg prosthesis. Naji is now able to walk and not only his general physical condition has improved but his mental health has also benefited as his family can once again count on him as a support.